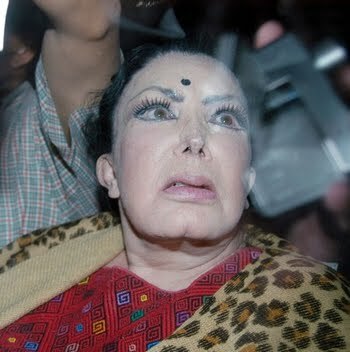 Irma Serrano La Tigresa plastic surgery disaster. 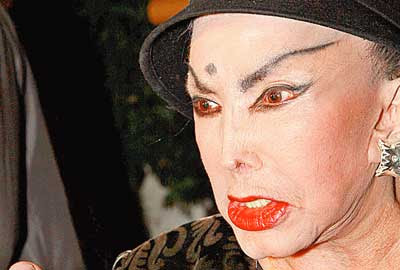 Meet Irma Serrano or perhaps better known as "La Tigresa", a Mexican actress and singer who has appeared in over 100 films, along with a lengthy television stint and a career which has been laced with controversy and scandal, including a rumored affair with Mexican President Gustavo Diaz Ordaz in 1967. And despite Irma Serrano's tremendous success and failure, she is perhaps best known for her extremely overdone plastic surgery procedures, which includes a botched nose job that left her nose completely disfigured with virtually nonexistent nostrils. Aside from the notoriously bad rhinoplasty, the actress is also believed to have undergone a complete facelift procedure and had facial filers among numerous other suspected operations. I can't quite decide if she looks more like Jackie Stallone or a female Mickey Rourke. 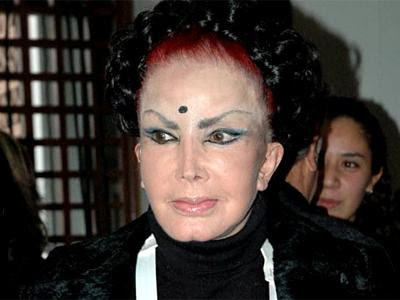 We've featured plenty of unfortunately botched celebrity cosmetic surgeries in the past, and i think it goes without saying, Irma Serrano ranks in the top ten of any disaster list.